When visiting volcanoes, the first thing to strike you is the desolation. The ground is black without any sign of green, a lifeless wasteland. In Hawaii, walking through the rain forest, the sickness in the trees is the first thing that becomes evident. A little later, the forest opens up and disappears as the path reaches the lava flows. The desolation is not just from the burning by the lava flows. The sickness in the trees comes from the sulphates in the air. Death comes both from the ground and the air. Life will not return until the volcano goes dormant – preferably extinct. But this is not true everywhere. The oceanic rifts underneath the oceans are more active than any land volcano. But rather than extinguishing life, these volcanoes attract them. The hydrothermal vents are surrounded by fields of fecundity. To live here means to live fast, in a precarious balance. Just a meter too close, and you burn. Too far, and you run out of energy. But like goldilocks, pick the right location and there is a good, if temporary, living to be made. The first evidence for volcanically-powered life was found in 1977, in an area close to the Galapagos islands. Crucial to the discovery was a submersible called Alvin. Submersibles are expensive tools which are used over many decades. Alvin was first used in 1964 and I believe is still going. The name is in honour of one of the engineers, Allyn Vine. It is an impressive vehicle. Alvin is 7 meter long, 2.5 meter wide, and 3.5 meter high; even with a titanium hull it still weighs 16 tons. It can carry three people (including the pilot), has life support for 3 days (although a dive would not normally exceed 10 hours) and reach a depth of 4.5 kilometer. It can hover, or it can move around at a speed of 2-3 km/hr propelled by its five hydraulic thrusters. There are three thick portholes, designed to cope with the extreme pressure. A variety of powerful external viewing lights provide the illumination, essential at a depth where no sunlight will ever reach. Alvin has numerous claims to fame. It was one of three submersibles that in 1974 obtained the data that confirmed the theory of ocean floor spreading. More prosaically, in 1966 it recovered the hydrogen bomb lost during an accident in the Mediterranean. And best of all, during a 1977 dive near the Galapagos Islands, it came across the phenomenon of the hydrothermal vents. Two years later, it discovered the black smokers. The first sign had come from an autonomous sled which was exploring the sea floor and had recorded a sudden temperature spike. It was dismissed as an instrument error, until the scientists noticed that the still photo taken at the same time showed a completely unexpected landscape. Two days later, 17 February 1977, Alvin was send down. It found an oasis in what had been believed to be a desert, 2.5 kilometer deep. The presence of hydrothermal vents associated with the spreading ridges had been predicted, if not actually seen until that time, but their effect on the environment came as a complete surprise. The deep sea would never be the same. The presence of hydrothermal vents had been predicted in the 1960’s. After all, spreading ridges require volcanic activity. On land, approaching magma gives you hot pools, fumaroles and geysers – all the result of underground heat without requiring the magma to actually reach the surface. The heat is carried up by water circulating underground. You would expect the same mechanism to happen under water. Indeed, the hydrothermal vents are the oceanic equivalent of geysers and fumaroles, and they share the same cause. Location of the known hydrothermal fields. Click on image for full resolution. In the central valleys of a mid-ocean spreading ridge, the magma may reach as close as 1 kilometer to the ocean surface. Elsewhere it may be 5-10 kilometer. Water enters the ocean floors through cracks and begins to circulate below ground. Some reaches near the magma and becomes heated. Hot water rises, and it pushes its way back to the surface. The vents are where it comes out, either as a gentle flow of warm water, or as a super-hot jet spurting out of a small hole at high pressure. The temperature of the vent depends mainly on how deep the magma is. Where the magma is 10 kilometer below or more, the vent may only be 40-60 C. Where it reaches within 1-2 kilometers, it can be much hotter, in places over 400 C. And remember, the surrounding ocean has a temperature of only 2-3 C. The hot water rises vertically through the surrounding ocean. The first hydrothermal vent found was a mild one, operating at around room temperature. Two years later, a far more extreme example was found, a vent ejecting black water at hundreds of degrees C. The pilots of Alvin put a temperature probe into the vertical jet. It melted. The pilots realized that the perspex cover of the probe was made of the same material as their viewing ports. They beat a hasty retreat. One paper describes how a 2-cm thick electrical cable accidentally became draped across such a jet. It melted and split within 1 second! The heat capacity of water is much higher than that of air: the heating is therefore much faster than it would be even inside a flame. Calling the black smokers dangerous is a severe understatement. Luckily, the location of the hottest vents tended to be quite obvious, at least after their discovery. First, their water is pitch black; second, it comes out from chimneys which can be meters – sometimes tens of meters – tall. The black jets were quickly called ‘black smokers’, a name which now shows its age. Mike Ross famously told us that volcanoes don’t smoke – true for terrestrial volcanoes, but these hydrothermal vents most definitely do! The chimneys which they build up, when taken to the surface, even feel like cigarette ash. Later, it was found that not all submarine smokers are the same. Some produce white smoke rather than black. The chimneys come in fields, just like fumaroles tend to occur in groups. The fields have evocative names: one is called the Lost City. The chimneys can grow as tall as 40 meters. But once they get too large, they break under their own weight. The vents are also temperamental – they stop, and may restart from another hole nearby, just like the geysers of Yellowstone can change behaviour with every earthquake. A field of vents is a very dynamic environment and exploring them is a lot like walking in the crater of an active volcano. The ground underneath your feet may suddenly open up. This constantly changing activity gives a series of chimneys of varying height and activity, surrounded by the debris of the glorious fallen – in some cases toppled deliberately by the scientists trying to measure the water as close as possible to the source. Beyond the chimneys the ground is covered in a dark, ash-like substance. It is an image of unreal beauty: the fractal-like chimneys, surrounded by an utter, dark desolation. It is in fact remarkably like the landscape around terrestrial volcanoes. So what on earth are the vents smoking? The answer comes from the rocks below. Rocks do not dissolve easily. But the hotter the water, the easier the minerals dissolve. Especially iron sulphides, copper and zinc react with the water and dissolve into it. What comes out of the vent is, in some ways, like a liquid mine. As soon as the water shoots out, it meets the near-freezing water around and begins to cool. As the temperature drops, within seconds the dissolved minerals come out of solution and the water becomes suddenly full of microscopic solid particles – it is in fact exactly like smoke particles. The particles in black smokers are mainly a mix of sulfides (e.g. pyrrhotite FeS, sphalerite ZnS, chalcopyrite CuFeS2, etc.) and sulphates (anhydrite CaSO4, barite BaSO4). The solid particles, especially iron and iron sulphides, absorb the light in a way that the water didn’t – and the water turns black. Wherever a surface is available, the particles stick to it. This is what builds up the chimneys: the water jets build up their own cocoons. And the chimneys can grow fast, at meters per year. The jets also carry the particles further away, and some condense only when the temperature has dropped closer to ambient. These particles rain out further away and give the ashy cover of iron sulphide and other particles around the chimney fields. The process has been demonstrated in the laboratory by Laura Barge. She injected alkaline solutions into iron-rich acidic solutions. It made mini chimneys of iron hydroxide and iron sulphide. Temperature has a strong bearing on what minerals can dissolve. If the water is not hot enough, the iron sulphites do not dissolve. Instead, the water becomes laden with calcium and barium. Once they reach the surface, they can’t produce the black particles. Instead, the particles that precipitate out are white in colour. These are the white smokers. White chimneys, from a cooler, carbon-laden hydrothermal flow. If the magma is much further from the vent, the water can cool already underground while traveling towards the exit. The cooling can happen by conduction, losing heat to the surrounding rock, or by mixing with cold sea water circulating through the ocean crust. As a result, the metal and sulphide particles fall out below ground, and never reaches the surface. The water chemistry is very different in black and white smokers. Black smokers are highly acidic, worse than battery acid. White smokers are highly alkaline. The combination of dissolved elements, the acidic nature and the turbulent mixing with the alkaline sea water makes the black smokers sites of extreme chemistry. Most vents are close to the ridge axis, within the valleys on top of the ridge valleys. Not all do. Some may be as far as 10 kilometer from the ridge, well away on the slope where the surface is a million years old or older. The same, of course, is seen on land. Neither Bardarbunga nor Grimsvotn is on the spreading rift: they are on either side. Once perhaps they were near the axis, but as the new crust spread it took the volcanic conduits with it. They will now slowly drift away from the spreading centre, until they conduit becomes blocked, the volcano dies and a new one forms closer to the axis. In the sea, the vents located on the ridges are much hotter than those far away. Black smokers are found at the centre. White smokers dominate farther away. Water can exist in three main phases: solid, liquid, and gas. (Actually, the solid phase is not a single one but there are many different solids which can be formed from frozen water, each a different phase but few can exist on Earth.) In a geyser, the super-heated water boils just below ground, the vapour massively expands in volume and up shoots the jet. As it cools, a bit of the water re-condenses above ground, giving the mist that typifies a geyser and that gives the audience forgetting about wind direction a drenching. The phase diagram of water shows the well-known fact that ice can only exist at sub-zero C. (Interesting, that means that the only place in the entire planet where water can be solid is on the surface!). Similarly, water as gas (or steam) only exists if the pressure is less than 218 atmospheres. That pressure is found at a depth of just over 2 kilometers (the pressure under water goes up by 1 atmosphere for every ten meters). 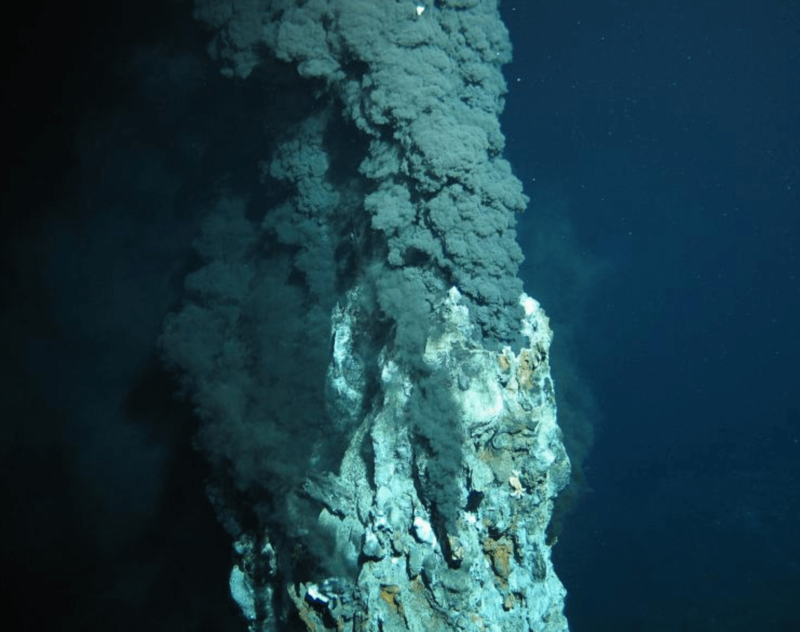 Hydrothermal vents that are deeper can not form gas, neither directly nor as bubbles. Neither can you get a phreatic explosion at these depths: it is against the laws of physics. The deepest vents, in the Caribbean, are some 5 kilometers below sea level. A these depths, the vents can only ever vent liquid water. But there is more. Pure water can only be a liquid below a temperature of 374 C. Salt water can remain a liquid to slightly higher temperatures, just above 400 C. But above that temperature, the water has to boil and turn into steam. But what if the super-hot vent is more than 2 kilometers deep? It is a catch-22: both phases are against the law. Physics has a solution. The water becomes a supercritical fluid, neither a gas nor a liquid but somehow a bit of both. It behaves like a liquid, but unlike a liquid it is compressible. Water does not compress. Try standing on it: it won’t give in. A supercritical fluid can happily expand when heated – a liquid does so only very reluctantly. In practice, this means that when the superheated water spurting out of the deep vent is a supercritical liquid, its density is much less than that of normal water. And so it rises. Normally, the jets from hydrothermal vents rise some 200-400 meters before coming to an end. But supercritical vents can rise much further, because their water has much lower density than the surrounding sea: the highest value measured is 1100 meter. The rising stops when the temperature of the jet has dropped below 400 C, where the water comes out of its peculiar state and behaves like the ambient sea water. The rising allows the mineral-laden water to spread out far and wide. Much of the chemical wealth of sea water, from gold to uranium, comes from this. It was brought to the bottom by hydrothermal vents, and as long as it remained soluble, polluted to the entire water column, top to bottom. And life loves these minerals. Especially the iron is pure fertilizer. The discovery of 1977 wasn’t so much the vents themselves. In fact, the black smokers weren’t seen until 1979. It was the life around the vents that drew the world’s attention. The deep sea is in many ways a desert. There is very little life, and what there is congregates around wind falls, such as the occasional whale carcass but more generally, the slow rain of nutrients descending from the top layer of the ocean. But the vent near the Galapagos showed a veritable rain forest. It was a luxurious garden, albeit of creatures very different from the norm. Some things were familiar: the octopi (they get everywhere), and the crabs. But the forests of tube worms and fields of Yeti crabs were unworldly. CO2 + 6H2O -> C6H12O6 + 6O2. The crucial aspect of this equation is that it takes energy to run, and for this energy plants use sunlight. There are costs: the process is not particularly efficient, and plants needs a lot of surface area, and they do not generate enough energy to do energetic things like move around. Animals do, but they obtain it by eating a lot of plants. There is far more biomass in plants than in animals: it cannot be otherwise, for reasons of energy. CO2 + 4H2S + O2 -> CH20 + 4S + 3H2O. The vent bacteria oxidize hydrogen sulphide, add carbon dioxide and oxygen, and produce sugar, sulphur, and water. Other bacteria make organic matter by reducing sulphide or oxidizing methane. All other life here is based on this food supplied by the bacteria. But you need a lot of bacteria to provide the animals with enough energy. So the animals take the same approach as trees, by providing as much surface area as possible. This explains the tube worms: the tubes provide the surface area, and gills make sure that water continuously flows over the inner surface. The bacteria love it. Molluscs have similar techniques, although mussels also are filter feeders, which makes them less dependent on the bacteria. Yeti crabs grow bacteria on their own legs. Other crabs feed mainly as predators or scavengers. It is a complex chemo-ecology. The varying temperature causes tremendous problems. The tube worms need to stay close enough to the vent to get the exhaust, but far enough not to burn. If the vent moves, the worm dies. The crab can move around and is a bit more robust. But even the crab will not survive if the entire vent field goes extinct. But the community very quickly re-establishes itself when another vent field appears – clearly the animals, in some form, move around the ocean quite easily. Not unlimited though: the hydrothermal vents in the Arctic ocean have quite different communities. The Arctic ocean is isolated from the deep conveyor currents of the world ocean, and it shows this in the vents. The hydrothermal life is often used as an example of how life on other planets or even on the earliest Earth may develop. But that doesn’t fully work. Yes, the chemo-synthesis does not require sunlight and provides an alternative to photosynthesis. But the reactions do need oxygen. The water that comes out of the vent is anoxic. The oxygen is mixed in by turbulence, coming from the oxygen-rich cold waters of the ocean. The scavenging crabs, also, can cope for some time with anoxic conditions as they move into the vented water. But they do need to go out at times to breath oxygen again. The tube worms can’t move well and need to grow on the interface where the vent and ocean waters mix. The early Earth had no oxygen: that did not come until photosynthesis had developed. The communities around hydrothermal vents could not have existed in their current form without oxygen being produced at the surface. There are organisms that use anoxic reactions for their metabolism, the archea, but their role in the hydrothermal vent communities is not well known. Volcanoes are anathema to life. In the long term, life benefits from the mineral riches they bring, but in the short term they are deadly. But life in the deep oceans has a much closer relation to volcanic activity. They have turned super-heated smoke enriched in toxic metals into rich oases. It is a different world, and one about which we know rather little. There are many discoveries to be made, new vents, new species, new life. The deep ocean is a final frontier which calls out for explorers to boldly go where only tube worms have gone before. It is volcanics with a difference. And I presume Loki’s Castle, at 73 deg North, is one of the more barren vent fields. No, it is well populated. It is one of the Arctic vents with quite a unique fauna. At the bottom of the ocean, it doesn’t matter where it is tropical or arctic: the temperature here is the same. At least nowadays. In the distant past the deep ocean may have been much warmer. It is thought that species spread along the mid-oceanic rift, jumping from vent to vent. But in the Arctic that gives a problem, since one side of the rift runs through Siberia, and the other through Iceland. maybe the communities got seperated when iceland surfaced ? very plausible. Actually that was not long after the Atlantic rift broke through to the Arctic, so the rift may have been open for only a couple of million year before Iceland surfaced. But that should be enough for anyone to move. At Mauna Loa, the intermediate-depth quakes dropped off during November and almost ceased since late December. In its place are numerous very shallow mini-quakes, occuring only in the crater and southwest rift and located in the edifice itself, not below it. I don’t know whether this is real or a change in the way measurements are done. Luckily with the shut-down in the US, its volcanoes won’t be able to do anything interesting. This may have something to do with all of the “negative” depth eq’s? Mayon earlier today. This was after tourists were seen to enter the exclusion zone and lava had reportedly advanced to 3 kilometers from the summit. Was this an actual explosive eruption, or a cloud from a pyroclastic flow from lava collapsing down the side? It looks like an explosion but with the clouds it is hard to tell. Is Mayon able to do a VEI 6/VEI 7 eruption? This is what a Mayon VEI-2 looks like. The possibility of any eruption larger than VEI 4 depends of the size of its magma chamber below. I don’t know if Mayon has a magma chamber that large to cause any VEI 6/VEI 7 eruption. That it not the full story. The ejecta measured by the VEI index are mostly pulverised rock: it is blowing up the mountain that does it, and there is often little magma included. So the important parameter is the energy that is available from the magma, which is a combination of the pressure it is under, the potential gas production, and the volume. Today Mayon had a Strombolian eruption with lava fountains shooting several hundreds of meters into the air. What caused this volcano to shift from pyroclastic flows into lava fountaining and has it do do with alternating layers of basalt and more evolved magma inside its main magmachamber? Great read as allways. Thanks Albert! This one was also covered on our post on inflation in volcanoes, http://www.volcanocafe.org/up/ where the conclusion was “Laguna del Maule has not erupted since the Spanish arrived, 450 year ago. It seems a strong candidate for an eruption, even if fairly minor, in the next few centuries. You read it here first.” This post, one year ago, also noted the inflation in Agung..
Mayon raised to Alert Level 4 following an explosion to 35,000ft. Is it just me, or are those drum beat quakes that we can see on the Agung seismo the last few hours? There is also an increasing noise level, possibly due to bad weather, so it’s hard to tell for sure. The increased noise is the quarry. The beat tends to happen in the afternoon and evening, and I think it is something to do with the conveyor belts. It is too regular to be natural. Interesting, the regularity from 8pm almost makes me think they must be artificial but they are also increasing in strength so something may be up. Just to clarify as i’ve posted the same time as albert – Tomas A, we are talking about the regular small eq’s appearing after 20.00 local time at intervals of 2-4min? Yes, I mean the ones after 20.00. They don’t look like the usual artificial sources from the quarry when you look at the spectrogram and the visual appearance in the drumplot is also a bit different. I think, these ones are strong lightning strikes. There were a lot of them in that time. I don’t think they are lightning as they last too long for that. I looked at the signals a few days ago and it seemed to me they are related to the mining, coming before or after the main afternoon mine activity. The amplitude is too constant to be volcanic. Hi Marek, that’s a very good point. Electrical interference from lightning i take as a single, saturated spike (eg looks like there was one that actually took the seismo down for a while around 13.15 this afternoon). The actual reverberation from the thunder however would i assume be more like an eq? Increasing strength could indicate an approaching storm (louder thunder) and the fact they started just before the background noise that we associate with flood waters is another flag. Web cam at the time showed that it was persisting it down. Thanks for the information. Next time I travel to CA to visit family we might have to make a trip up that way! I remember a speaker series video from the Tyrrell Museum, I think, where the speaker commented that some bacteria around smokers are, in fact, photosynthetic – using IR from the hot water expelled from the smokers instead of visible radiation from the sun. While being really cool on its merits alone, this infers something very interesting for extraterrestrial life possibilities: since life can exploit the IR spectrum for energy, anoxic life using an IR-based photosynthetic energy production process around the volcanics of Io, Mars, and many other solar bodies seems much more plausible. I would be very surprised if the IR was energetic enough for chemical synthesis. Not enough ebergy in the quanta. It is just beyond 1 micron. I also have some doubt whether it does much in the deep. Most bacteria with this ability live close to the surface. The benefit around black smokers will be marginal at best. It is quite possible that these green-sulphur bacteria have the ability as an evolutionary left-over, having migrated from the surface. Indeed. 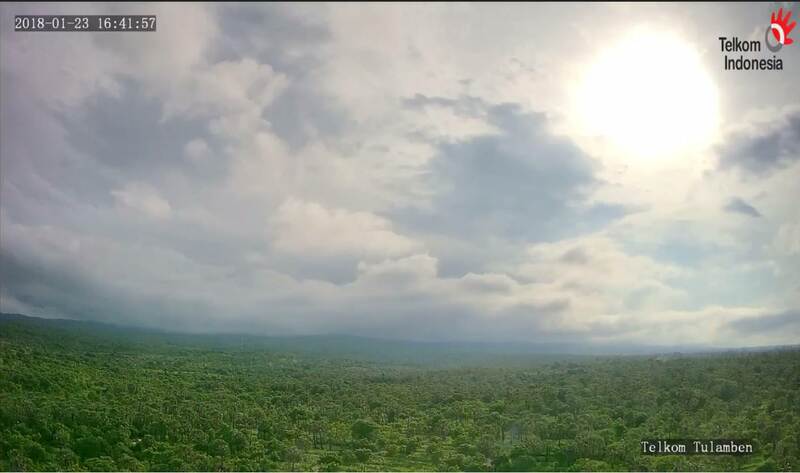 The weather is very poor, judging from the webcams, so I am wondering whether that is related. Agree!! Calmed down for now. Could it have been a new pulse of magma pushing its way up? Difficult to know without more data. Well it currently seems that all the Agung cams are down and the seismo seems to be going nuts. Anyone got a link to a working camera? Thanks for the link, but that cam is still frozen. That’s a nice tool! I bookmarked it. In Iceland, it looks like the IMO finally decided to remove the M3 at Hamarinn from the Grimsvötn cumulative seismic moment plot. If you know which plot I mean, you probably know which quake I’m referring to (the one that caused a big jump in the plot). I haven’t checked if they changed the area to a tighter box around Grimsvötn, or if they just removed that single quake. I think it was discussed in a previous VC article by Albert and Carl if that quake should be included in the analysis or not. And now it’s back in the plot. Oh, well, never mind. I missed this comment before. That’s some of the best reporting about Agung I have seen. Thanks a lot! Excellent link Wendyl, many thanks. Wonder if the 6+ was really a local one? GVP mentions a history of phreatic explosions; this has that kind of smell to it. Videos on that page appear to show lapilli falling. A big movement Agung at 14:30 local time. Is the “big movement” due to the big EQ of 6.3. Agung is doing some weird stuff. The bright glowing area is NOT the sun. And another one. Mind you an hour ago it was clear. The sun was not over there. I watched for a while later than this, the glow didn’t behave like a setting sun. It did move towards the mountain but it also moved up at one point, and there was another glow that came from the right side later and followed a similar path. Furthermore the glow appeared quite suddenly. It might have been the sun but it didn’t look like the sun in real time. 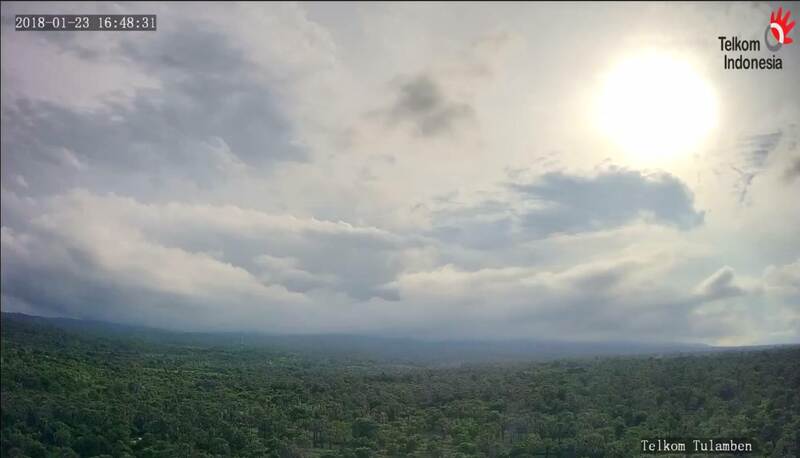 There is also a moving cloud cover between the sun and the camera which affects the appearance. Trust me, it’s the sun! M8.2 off Alaska. Tsunami warning & watches out. That is the largest earthquake in Alaska since 50 years. Not really. They tripped over their own subterfuge and the gov was unexpectedly restarted yesterday. This year has been a big year so far, even if not even one month has passed. two volcanoes have erupted where no eruption had happened historically before (kadovar, and now apparently moto-shirane) Then a very big earthquake, probbably the biggest since 2011. Sierra negra volcano in the galapagos is also at a point where it could erupt, with over 4 meters of inflation since its last eruption in 2005, and this inflation is actually more than before 2005 so an eruption could happen at any time. Apparently it is capable of eruptions in the cubic km range. Its 1979 eruption was about 1 km3 in two months, mauna loa in 1950 managed only 0.3 km3 in one month, and that is considered a very powerful lava eruption to which other lava eruptions are compared. The eruptions almost seem to be more like mini flood basalts akin to the eruptions in Iceland, actually if sierra negra continued erupting in 1979 until the duration reached 6 months, it would be quite a bit bigger than holuhraun. This could be something to watch for. Source: USGS catalogue of earthquakes. You would expect several earthquakes of this size per year across the world. But Alaska has has few in recent decades, possibly because the M9 in the 1960’s resolved a lot of the build-up stress. Had a quick look, it’s also capable of quite potent explosive activity, with the starting phases producing 15+ km high columns…. A bit of a cross between Hekla and Mauna Loa…. Interesting to watch. Sky News are saying the entire West Coast of the USA is under Tsunami alert. With the potential of a magnitude 8 quake, I think most of the Pacific should probably be taking note. I see that a warning has been issued for Hawaii. I can see you getting the surf board out. No tsunami wave reported in Kodiak, nearest to the earthquake. This is a good sign. Even if I lived there… Absolutely not ! No way would I attempt a tsunami. I know first hand how much energy is in these long period waves when they start piling up as the front edge slows in shallowing water. Local paper reported a wave a foot or two high in Kodiak. No confirmation, though. Coast Guard in Kodiak were sufficiently concerned to launch the fleet upon warning so as to be airborne when the wave hit. Lots of Kodiak residents decamped for higher ground. Same thing happened in the Homer Spit. No word from Seward on waves or warning. Here in ANC, P&S-wave arrival announced themselves with rattling pulls on dresser next to bed. Went on for a while before the surface wave showed up. 600 km north of the epicenter and the house rolled a moderate amount. The Iliamna 7.1 a few years ago was much more violent shaking. – P&S waves decouple from surface waves and arrive first. Sensed as a buzzing / light shaking / rattling of the entire house. Followed by the surface wave. The larger and closer the earthquake is, the worse the surface wave is. Time between one and the others tells you a bit about both distance and magnitude of the quake. in this case, I thought it was large and a long way away. Turned out to be larger and farther than I expected. Glad to hear there were no major problems from the quake. It could have been bad. Did you have any swinging lights, from low frequency waves? Looks like it’s all off. Scale 4 aftershock. No tsunami of any note. That’s a relief. Has anyone seen a Beach Ball for The Alaska quake today? Yes. Mostly strike-slip. 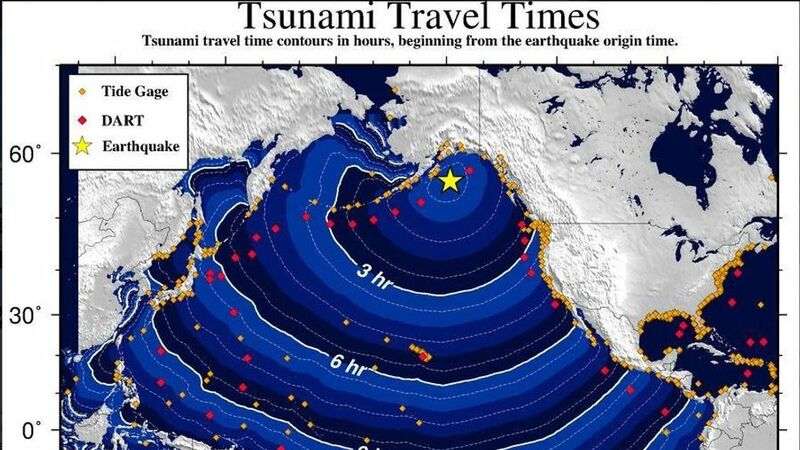 That’s why the tsunami threat turned out to be less than initially thought. I read an initial assessment (can’t remember where – daft me) that the quake originated on a fault south of the main subduction trench. It now bothers me that this could (I’m not an expert) be a sign that the subduction could be locked in the area. Pressure from the locked subduction zone distorting faults in the Pacific plate itself as it presses against the area. Anyhow, that’s a pile of speculation. Glad you are OK! No damage I hope? Not a nice experience at all. Thank you for letting us know you are OK.
Glad you’re ok. Thought of you first when I heard it was in Alaska. Thanks, Albert, and when stuff happens close to home one doesn’t always have the time to update all the web connections… i knew Lurk would be interested….. and these large quakes even impact his water table in Forida….. Probably why I heard the septic tank burp. And Hugh Masakela…. and (for those familiar with British post-punk) Mark E. Smith of The Fall. I’ll be honest, I always thought Smith was massively over-rated, but Ursula Le Guin and Hugh Masakela, have both been a part of my life. Oh no, Mark E Smith. The Fall was a great band, never got to see them live. Here’s a time lapse of Sinabung Jan 22. Kusatsu-Shirane, was that a phreatic eruption ? Here is a video of kusatsu-shirane showing the vent today after the main event. It was on a flank cone not the main vent complex where there is a very acidic crater lake. There also was apparently some volcanic tremor and the fact the vent is still steaming maybe means there is a lot more heat, especially when there was nothing there before. On google earth i’m placing that fumarole at 36 37′ 40.06”N 138 32′ 29.80”E. Possibly the head of a small gulley – maybe a hot spring? Looking at the CCtv video of the blast, the skiers can count themselves extremely lucky that there were not more casualties/fatalities, some very large derbies coming down with energetic impacts on the ground evident. According to NHK world news, people are livid that no one warned them about it. The geologic authorities has been expecting activity from a different cone than the one that popped. Phreatic eruptions do not give much warning, if any. Does anyone know what the evac/exclusion zones currently are around Sinabung? I’ve assumed that it is not a heavily populated area in comparison to say Agung, but there are still plenty of villages nearby. 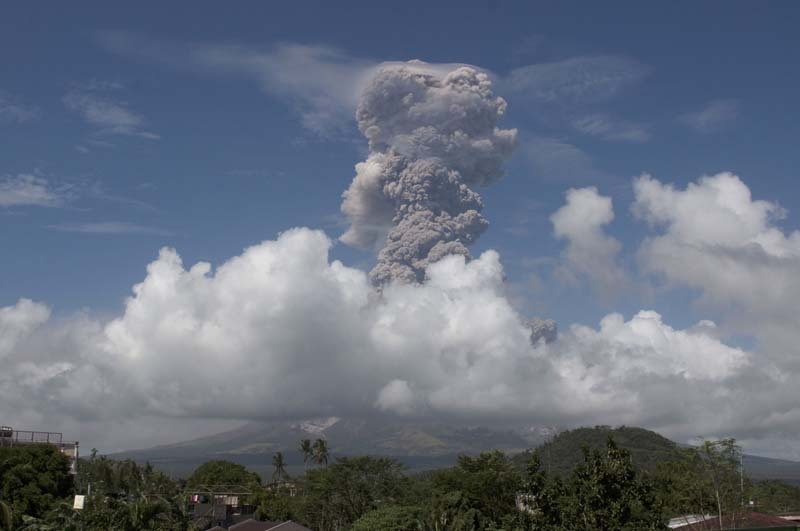 Also – do we have an idea of what sinabung is capable of in terms of eruptive history? Not a lot to go on with global volcanism program and i’d guess that the locality to toba may have erased/muddled any evidence? GVP does not have much info on Sinabung eruptions: just two VEI 2’s in the Holocene. But there is an exclusion zone and many were evacuated when Sinabung started its current phase of eruptions. Last I heard (a while back) there was talk of permanently displaced people being rehoused. Sinabung seems very active today. Is this normal for this eruptive phase? (sorry, I haven’t been paying much attention to it). Haven’t checked the seismogram much before today, but Sinabung has been erupting frequently, probably almost daily. Many thanks KarenZ, <15k @10km is not too many in terms of getting people away from any immediate danger. I had not been paying much attention to Sinabung, what with Agung grabbing the attention, and had kind of regarded it as a relatively harmless, picturesque, continual erupt-er. A SE Asia equivalent to Etna perhaps but that's probably a bad assumption to make for any volcano and a really bad assumption to make in the Sundra arc. Erupts frequently but not harmless; regular lahars and PCFs. 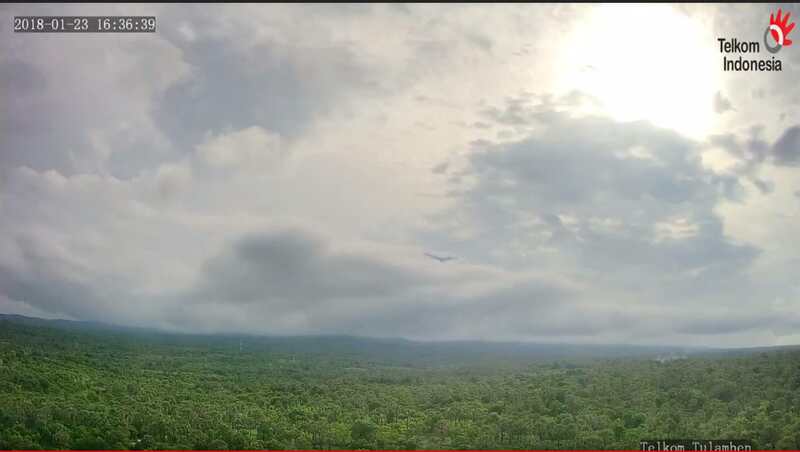 Also some of those nearby villages may now be under the new lava flow / ash that you can see on the web cams. Getting the tank pressurized to that environment might be an issue. Pressure, temperature and the right minerals, all a bit problematic i guess. No, you would use up the energy saving by what you would need to keep a hot mineral rich stream percolating into the tank. And with keeping the rest of the water chilled to the ambient temp that smokers exist in. Not to mention what would happen if you lost containment pressure and your superheated mineral rich stream is free to flash into steam since its no longer above the critical pressure. Could get messy fast. Huge explosions every time you remove the lid, would be problematic for the entire neighborhood I guess. But, if I am to be serious. In theory, there may be some of these volcanic-animals, that wont necessarily need the high pressure, and the most extreme temperatures. Perhaps some could live at 1bar, below boiling-point, if you found a way to make up for the sulphide metabolism. The pressure should not be a requirement. Yellowstone does similar environments at ground level. The heat can be tempered to 30C which the aquarium can cope with. The big challenge is the oxygen level and the mineral content. But overall, it would not be that different from a reef aquarium. I’d set it up in an indoor swimming pool, I think. Sorry, didn’t update before I wrote. Missed your post. But, yes. I agree. But, again, some animals could require alt least some pressure, if they are to thrive and make new generations. I don’t know. Has it been done with some of the animals? Don’t think so! The thing to notice is that for temperature stability , you will need a very large volume of cold water compared to the amount of hot water that comes in. You’d want to either make it a microsmoker (which limits the size of animals you can have) or a very large aquarium (which is why I suggested an in-door pool). Obviously, it would have to be a mild-temperature smoker. You do not want boiling water injected into the aquarium. So we are talking white smoker rather than black. Or, perhaps just make a tank with temp/chemistry that matches the environment of the animal, in a homogeneous mix. Wouldn’t be a biotope aquarium, but may be enough to keep specimens happy. I know some species of “deeper water fish”, even if their eggs and larvae attach to the substrate, can be difficult to breed, because the eggs need the pressure. As I recall, oxygen uptake related. The worms and crabs are filter/algae feeders and the algae live off sulphur. It would be quite a smelly aquarium. And the answer to the sudden appearance of negative depth quakes on Mauna Loa and the disappearance of the medium-depth quakes: They shifted the depth calculations by 4 km so they are now reported relative to sea level. Thanks Albert. We figured out that something was going on but it helps to know what it was. I guess we will need to remember the hight of any volcano we are watching to know how deep the quake is. Yes, bit for some reason the events are much better visible on the Batur seismogram which of course is the volcano next to Agung. Does not mean it isn’t Agung: the Batur one may just be more sensitive. I loved this article which tied in nicely with recent Blue Planet 2 episode that featured underwater chimneys. I also liked this one a lot about Nyiragongo, the night footage of the crater lake is stunning. New post is up. Continuing our colour theme, we are moving from black to blue. And from the Earth to the moon – and back.